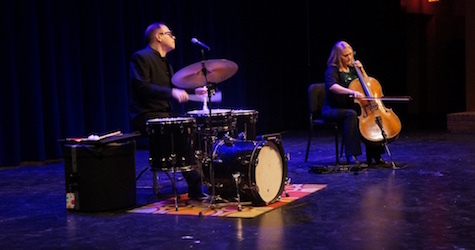 Earlier this fall, Prairie welcomed Nineteen Thirteen to campus for a special concert and question and answer session. The group came to campus as part of Prairie’s 2016 Visiting Artist Series, an initiative conceived by Jamie Breiwick, Instrumental Music Teacher. “The goal is to bring world-class performers into the classroom to provide students with direct contact to established and emerging innovators and professionals in the Arts,” says Breiwick. In addition to Nineteen Thirteen, the Series has also seen the David Hazeltine Trio and John Raymond & Real Feels visit campus this fall. The Prairie School Music Department is currently establishing the series schedule for second semester. Local music teachers and educators interested in bringing students to future Visiting Artist Series events at Prairie, can contact Jamie Breiwick at [email protected] for more information. This entry was posted in All News, All School, Featured, Performing Arts by Brendan O'Brien. Bookmark the permalink.